bāsupport, inc. (pronounced \’bā-sǝ-“pȯrt\, rhymes with bay-support) is the combination of two words; ‘base’ (as in basic or database) and ‘support’. 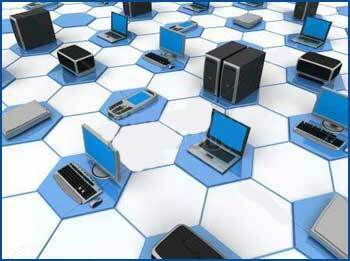 This represents what our company offers – basic information technology (IT) support along with database support. bāsupport, inc. is an organization that offers information service support and professional consulting to medium and small business that use networks and computers. bāsupport, inc. was formed in the late 1990s to fill the need of many small to medium sized companies that found they required the use of easily affordable computer hardware and software, but couldn’t afford (or didn’t realize they needed) the support staff to properly install and maintain their computer systems in an efficient and productive manner. Throughout this website, there will be special sections separated from the main topic that are titled “The Drew Way…” The founder of bāsupport, inc. is Drew Sweeney. He has been involved in the IT industry professionally since 1979. Through his education and experience since that time, he has developed certain practices and procedures that lend themselves to the efficient and effective operation of IT configuration and operations for small to medium (and often large) companies. The set of special ‘…Drew Way…’ sections will describe a specific practice or procedure related to the current topic. It will also include an accompanying detailed explanation of why the practice or procedure is a good idea for a company or user to follow. These practices and procedures have been developed over the past sixteen years of consulting by for customers that don’t have a full-time in-house IT person or department but would like to get the full professional and stable advantage of their IT environment. With the recommended practices and procedures in place, you will only have to contact bāsupport, inc. when something changes. This will give the customer all the advantage of a full time IT department without the expense. Most small to medium sized companies find that using modern computer hardware and software, connected to the internet, offers a very useful and essential tool for the effective execution of key business activity. Modern computer hardware is powerful and affordable. Modern software, properly configured, offers users many tools that can leverage the effectiveness and productivity of one or more individuals within a company. A company owner and employees can now perform many and varied tasks including: accounting, analysis, bookkeeping, contact management, correspondence, document creation, e-mail, and line-of-business activity. Using professionally available and often very affordable software can mean the difference between a profitable and successful company that meets customer needs and one that goes out of business. Why is affordable and powerful hardware and software a problem for many users? Doesn’t the modern graphical user interface (GUI), with point and click capability, offer intuitive, easy-to-use, systems that anybody can run with minimum to no training? The real answers to these questions actually are related to the great amount of capability and flexibility that modern computer systems can perform. Yes, modern software is intuitive and often easy to learn and use, but in the process of being easy to learn and use, it is often complex at its core. Individual software components must work with many other software components in diverse ways that require an overall understanding of software interaction that many users don’t realize is a critical factor in the operation of integrated computer hardware and software systems. That is where bāsupport, inc. comes in. Our experience with IT system setup and maintenance can benefit small to medium size business with “virtual on-site” IT department without the “full time” expense. With the proper configuration, users only call and pay-for the expertise when they need it.